This stunning instrument literally glows. It is crisp, and clean, and clear, and classy. Dazzling, delightful, bewitching, ravishing! We call your attention to the spectacular blue flower horn. 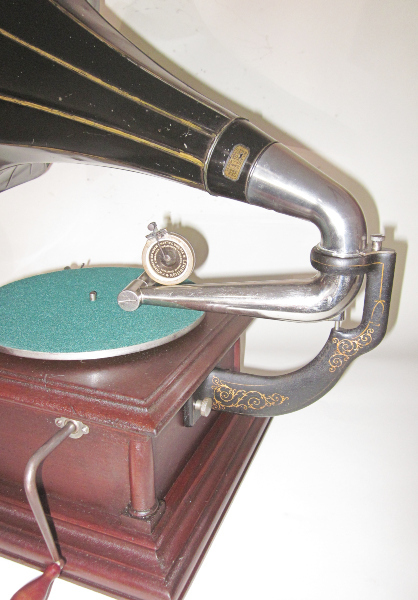 A horn such as this was available in music stores at the time to replace the rather sedate all-black Victor horns. We carefully restored it using our proprietary 4-step process to precisely replicate the translucent turn-of-the-century color, and our resident artist added charming cabbage roses in the style of the period. The condition of this instrument is truly remarkable. Please note how shiny the nickel-plated hardware is. We restored the bracket with historically correct gold filigree. Of course, we rebuilt the soundbox to produce sweet, loud and clear music. Why do the talking machines of other dealers sound so tinny and shrill? Because they do not have the expertise or the inclination to adjust the soundbox correctly. At phonophan, 49 years of experience goes into every instrument. 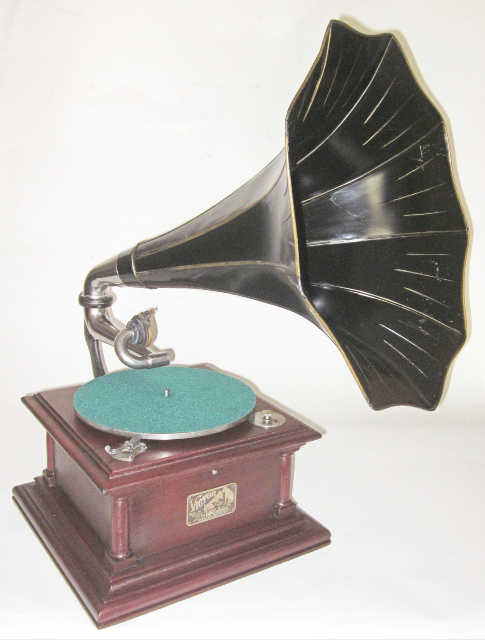 The IV (4) was the only other full-sized mahogany talking machine made by Victor besides the princely-expensive model VI (6). The IV (4) cost more at the time than the oak models below it in stature, and therefore it sold in lesser quantities. The curvaceous styling of the IV was unique within the Victor roster. Note the "His Master's Voice" ID plate. The cabinet finish has been achieved by following the exact process used at the Victor factory -- no fake urethane or slap-dash amateur doll-ups.We have painstakingly cleaned everything. The nickel-plated components are very well preserved. The motor is strong, reliable and the power of its double-spring will play any record. What's the difference between what you buy from us and what you buy on eBay? EVERYTHING! On eBay you get patched-up junk that is grossly misrepresented. You shouldn't believe a word of what you read there. 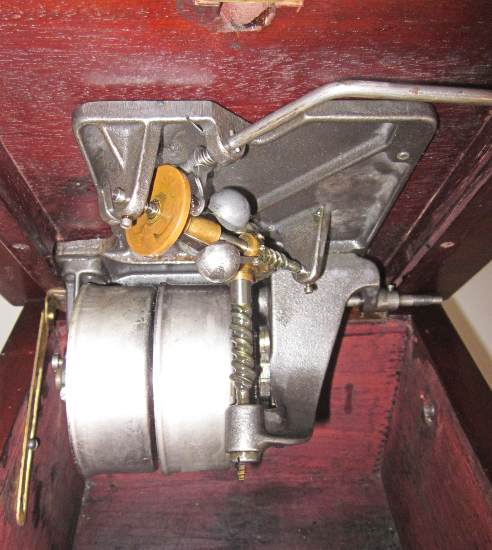 Phonophan gives you the highest quality instruments and restorations, all work done under the personal supervision of Tim Fabrizio, who has a degree in Fine Arts, has devoted his life to painstaking restoration work, and has written eight books on the subject of antique phonographs. 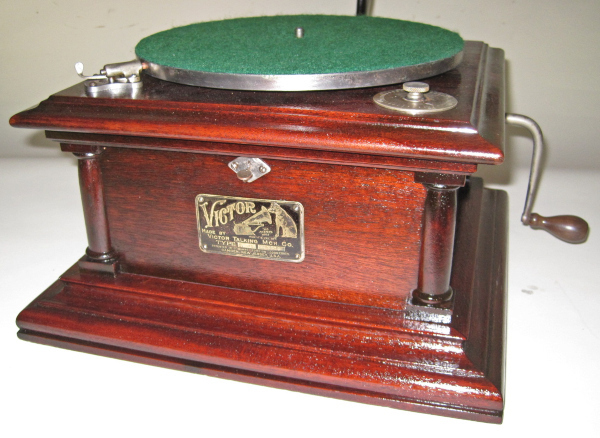 Most Victor talking machines were constructed of oak. Reasonably few were mahogany because mahogany was more expensive. This makes the Victor IV a rarity, and the look of it is undeniably alluring. 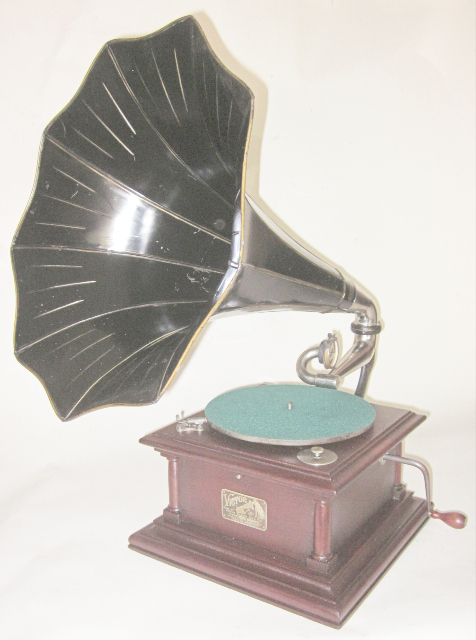 If you want to experience what a Victor Talking Machine was like when it was new -- get this one! This incredibly pristine, excellent playing, sleekly beautiful Victor is a delight to the eyes AND ears!